He already feels that the little one has both the parents DNA and will grow up to be a hardworking individual. 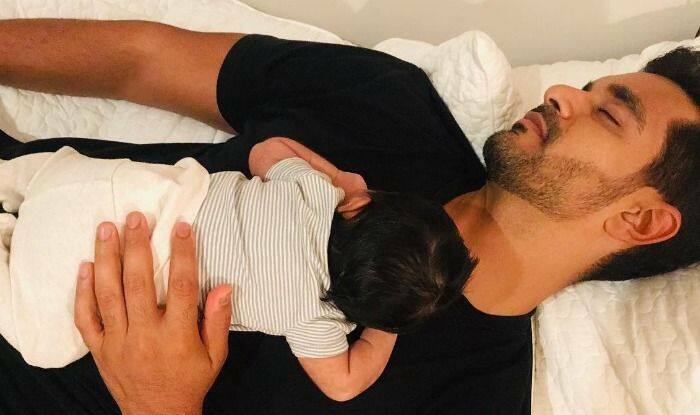 Indian film actor and model Angad Bedi is in the middle of parental bliss as he is seen gushing about his 50 days old beautiful daughter at every odd hour. Making sure to support his actress-wife, Neha Dhupia all the time, Angad is often found celebrating fatherhood and we totally marvel seeing him in the midst of all this amazement and speechlessness that he says he is. In a recent interview with Pinkvilla, Angad revealed that the first time that he held his daughter Mehr was when she came out of her mother’s womb. “I cut the chord and for me, it was a surreal moment. You know till the time it doesn’t happen you don’t understand. When the delivery is about to happen, those are moments I will always consider them as the most special. Winning an award or signing of the film can never be compared to the feeling of holding a newborn in your arms. I feel that Mehr Dhupia Bedi is my biggest achievement and I take full pride in being called her father” said the new father. Considering her to be his lucky charm, Angad revealed, “I have managed to sign four projects. I have finished shooting for three of them and one, I will start in February. All my producers and directors have been kind and they adjusted even when Neha was expecting. I just want Mehr to be a good human being who values everything in life and understand the fact of making money through hard work.” The plans of her future activities have been decided too like a typical father. “I would like to put her in many sports-based activities. Neha asked me one day, ‘What do you want Mehr to do’ and I said, ‘I would want her to win a Gold medal for the country in Olympics’. It’s the age of women and we have examples like that of PV Sindhu, Sania, and Saina. We would like to encourage her to stay close to nature and away from Ipad or phones. I would want her to learn from grandparents. My dad has many anecdotes to share from the world of cricket and Neha’s father is from the Navy. She will have a mix of both the worlds” gushed an excited Angad. On the professional front, 2018 was a fruitful year for Angad whose Soorma did well at the Box Office. He has signed three projects – one with Ekta Kapoor and one with Zoya Actor. In 2019 Angad has a total of four releases.